For the health of my marriage, we are instituting a mandatory weekly art night, wherein we ignore all the stuff we SHOULD be doing and just work on art stuff. 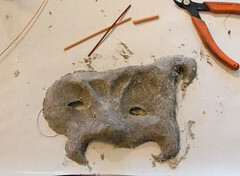 Here’s a mask I built from paper clay that will be used for a piece I’m working on. It’s heaped on there pretty good, it’ll be drying for days. At the last minute I added a light dusting of dry paper clay for texture, but when the heat gun hit it it blasted the stuff all over the kitchen. Our cat Torque Smackey was supervising nearby and subsequently had to have a lengthy tongue bath. I also experimented with my new coiling gizmo and whatever wire I had laying around. The coils with the super-fine transformer wire feel really neat. This is my first time with paper clay. I have to say that it’s probably a lot cheaper to use the crap they blew into our walls as insulation. Seems like it was the same stuff. If I start doing a lot of this I might try it. you seem to have the midas touch. Your work is supurb! Then again, you were always gifted with your hands-no surprise there. Keep up the good work.